green tea: Let's play Wong Kar-Wai Bingo! 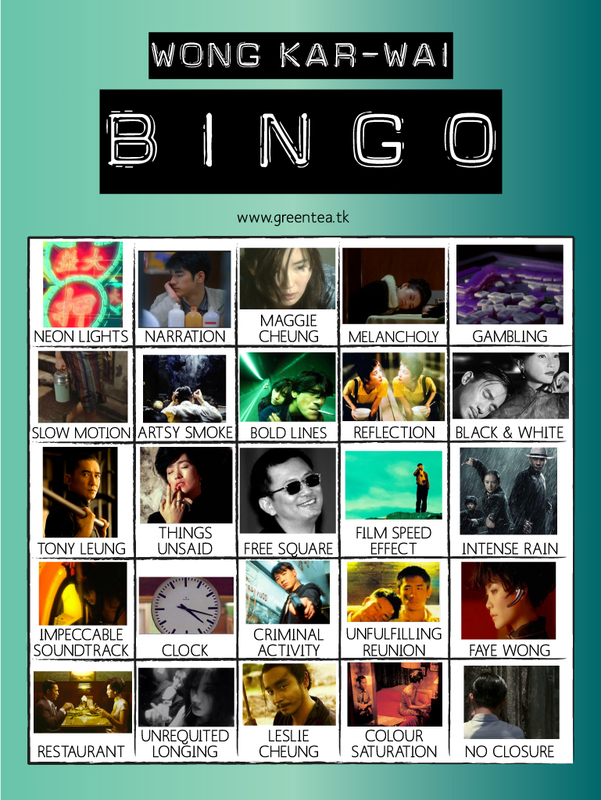 Let's play Wong Kar-Wai Bingo! To celebrate the North American opening of director Wong Kar-Wai's The Grandmaster, I've put together a bingo game. Wong Kar-Wai has such a distinctive style and uses many common motifs - part of the enjoyment of watching his films is identifying all these WKW trademarks. I finished making this before I saw The Grandmaster last night and yes, the bingo card is compatible for this film too. The inspiration for the bingo card is the New York Times' Haruki Murakami bingo and Slate's Wes Anderson bingo, although I can't match their fancy 'shuffle for new board' feature. Leave me a comment if you can think of something else that belongs on this board, or if you played it while watching a WKW film! Some of the elements on my WKW board are open to interpretation because WKW films themselves are very much open to interpretation. I almost put Tony Leung as the free square since he is in most WKW films anyway. Obviously, I do not own any of these images. All the images are under the copyright of the following films: 2046, Chungking Express, Days of Being Wild, In the Mood for Love, Fallen Angels, The Grandmaster, Happy Together, Ashes of Time Redux. I'm not an Adobe Illustrator expert - I'm sure somebody will find fault with the alignment of the images.